All versions of the N64 can be RGB and HDMI modded. The UltraHDMI board works with all versions of the N64, however there are a few choices for RGB. Borti also released custom firmware that allows for “de-blur” options. This firmware will work on both his and Tim’s kits! Early versions of the N64 (the first 4 board revisions) can output RGB with a board that offers the same video quality, but is much easier to install and less expensive. There are a few tricks to find compatible N64’s, but the only way to be 100% sure is by opening it up. – If you have a serial number that starts with “NS1” (USA), “NUJ1” (Japan) or French systems with the model number “NUS-001(FRA)”, then you most likely have an N64 that’s compatible. Supposedly, some early Canadian N64’s also contain this chip. – If you have a serial number that starts with anything else, or is a PAL console, you’ll need to use the “advanced” kits described above. 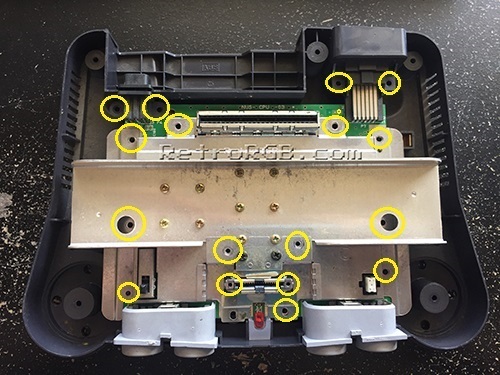 Regardless of serial number, please open your N64 to double check that it has the correct video chip that’s required for RGB-modding (explained below). To open the system, you’ll simply need a 4.5MM game tool and a philips screwdriver, as described in the tools section. – Once it’s disassembled, look for the following chip. If it says “VDC-NUS” or “VDC-NUS A” (like pictured below), you should be fine and can proceed with the basic RGB mod. If it doesn’t have this chip, you’ll have to use one of the advanced mods. Now that you’ve determined which RGB mod will work for your system, please head back to the main N64 page, or head to the main console section to check out mods for other consoles.